How Pokémon Go Players Interactive With Businesses #Infographic ~ Visualistan '+g+"
Pokémon Go has exploded in popularity since its launch. It’s already the most successful mobile app ever. The Pokémon Go craze has attracted a lot of new business for business owners. Business owners can set lures that attract gamers to their businesses. Much has been written about how Pokémon Go is driving money towards business owners, but there hasn’t been much covered on how Pokémon Go users are actually interacting with the businesses they visit while gaming. 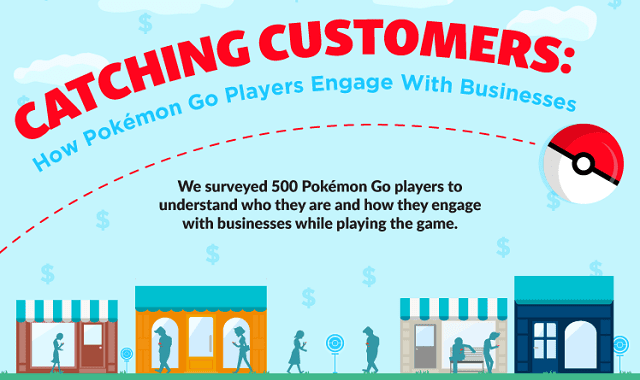 Slant Marketing surveyed 500 Pokémon Go users to find out just how users are engaging with businesses. They took the results of that survey and turned them into a strategic guide for businesses owners that can be seen below. In the guide they break down the demographics of exactly who is playing, the prime time for playing, how businesses can leverage this information, as well as useful tips for businesses. To learn more check out the infographic from Slant Marketing.